Adorned with a hodgepodge of sprockets, gears and cogs, the "Clockwork" Trinket Box looks as though it was cobbled together by a gilded-age mad machinist in his dreary, gadget-strewn, steam-powered workshop. It's molded from tough cold cast resin and is painstakingly hand painted in varying shades of pewter, charcoal, ash and gray. The result is a grim, industrial metallic finish that mimics aged steel shrouded in a charmingly dingy patina. The striking box is decked out in a myriad other fine, authentic-looking details like simulated iron bolts and worn wooden planks. Remove the lid to reveal a hidden cavity that's perfect for storing jewelry, candy, office supplies, a stamp/rock/button/coin/other collection, cash, keys, beads and countless other small items. At 6" long x 4" high x 3 3/4" wide, it's amply sized for common curios and knickknacks but won't take up excessive space on an average desk, end table, bedside table or other compact space. 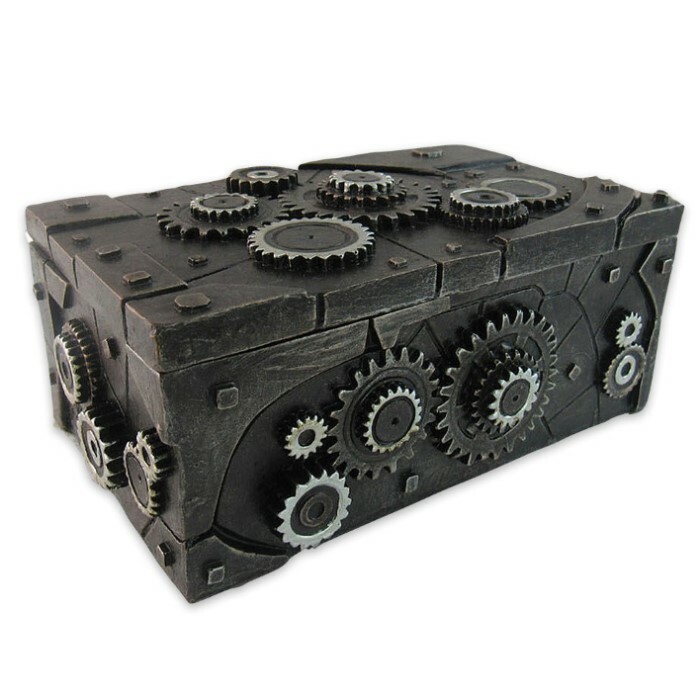 Regardless of what you decide to do with it, you can be sure the "Clockwork" Trinket Box will draw plenty of attention and praise. It also makes a fantastic gift for steampunks, NeoVictorian sci-fi fans or anyone with an eccentric, slightly dark sense of style.